This series is focused on integrating math and science concepts into my paintings. As both an artist and a scientist/mathematician, when I view the beauty of the world around me, I also see the math and science embedded in ithese scenes. The text, formulas and scientific concepts are integrated into the paintings same as they are an integral part of the world around us. Having experienced New England's rocky beaches for most of my childhood, I was fascinated with the sand patterns created by wind and the soft sand of North Carolina's seacoast. I began to take photographs in the 1980s, and have now gravitated back to these images for a series of ink, and ink with watercolor, drawings. I use a variety of styles in my work because I do not feel that a single style can communicate everything. When viewing a scene, I ask myself, "What do I find fascinating in this scene; what is it that makes me want to create art from this scene?" My answers are sometimes certain riveting details, or the expression of a concept. Sometimes it is the general patterns of color or incredible beauty. My answers vary tremendously, but when I find the answer to what I want to communicate, my next questions is "What is the best way to effectively communicate my objective?" As an artist, I find that intriguing detail can be communicated through a realistic style via colored pencil, soft pastel and sometimes paint. To communicate abstract concepts, I have used paint or even cut paper. I have used ink to communicate stark patterns which often reflect my love of mathematics. My ideas are too varied to communicate completely through a single artist's statement. 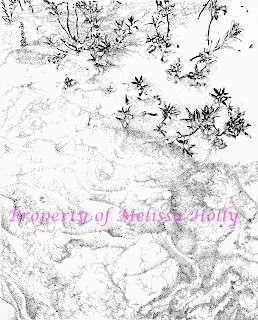 View my art and determine for yourself what each piece communicates to you as a viewer. Enjoy. From grand scale images to those that are very close up, images surround us. I love those images, and as an artist, I try to share this love with my viewers. From the mundane to the glorious, this World is filled with fascinating sites. Sometimes, a field filled with morning mist will make the viewer pause and breathe more deeply. Other times, an old door can make the viewer wonder who has passed through it, and what were their circumstances. Walking up a flight of steps outdoors, I stop and look to see what has collected in corners of the steps; it is often a collection of items that tells the history of those using the steps. Life never ceases to surprise me; and there is always something for me to say through both my art and math.